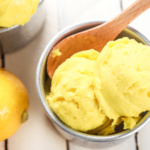 Grab a few easy ingredients, throw them in the blender and in a fews hours, a refreshing and unbelievably healthy lemon turmeric sorbet will be all set and ready for digging in!! Transfer into a covered container and leave for 4 hours in the freezer. We’ve kept this dessert dairy-free, but if you want an even creamier treat, just add some milk or yogurt into the blend, and voila! You’ve got a creamer sorbet.